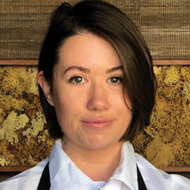 The young Colorado native manages the pastry station of the three-Michelin-starred restaurant Coi in San Francisco (California). Many ideas come together in her creative mind, but always with an inescapable goal: to maintain a line of cleanliness, clarity and perfection throughout the entire restaurant menu. Conservative to a certain extent when it comes to unleashing her creativity, she prefers to draw inspiration from some of her closest references, such as Michael Laiskonis or Shawn Gawle, to round off her proposals. Something else that stands out is the work at the end of the menu with the mignardises, her proposals in mini format are directly inspired by some of the classic references of French pastry.